$195.00 Group of 3 Photo IDs to a Quartermaster Colonel, a high ranking officer of the Main Military Construction Agency. Includes his Narkomat of Defense ID issued in Moscow in September 1941 which contains interesting information on his service and awards. The other two photo IDs are passes to unspecified locations, apparently Defense Ministry building or Agency headquarters in Moscow. An extremely uncommon set! $250.00 Photo ID of the Chief of the Archangelsk Inflot, the agency servicing foreign ships arriving in Soviet ports. This highly unusual, high quality document was issued by the Narkomat of Merchant Fleet in October 1941, during early Patriotic War period. At the time, seaborne Lend-Lease military supplies from the UK to the Soviet norther ports such as Archangelsk provided a critical lifeline for the Soviet Union teetering on the brink of collapse. The ID is in excellent condition. $150.00 Photo ID Card of a Senior Officer of the Narkomat of Merchant Fleet. Issued in July 1942, at the most critical time when the Lend-Lease lifeline to Murmansk had been nearly cut by the German U-boats and Luftwaffe (the infamous Convoy PQ 17 disaster happened just days before). A very uncommon document in excellent condition. $225.00 Red Army Officer Photo ID, issued in March 1942 to a senior staff officer. A native of Moscow, he fought on the front lines from the first days of the war, took part in the defense of Ukraine, Kuban and Caucasus, participated in the famous Malaya Zemlya amphibious landing operation at Novorossiysk, and ended the war with the rank of colonel and several decorations. The document is hand-signed by Major General Iosif Lennovich, 18th Army Chief of Staff. This highly uncommon and interesting document is in excellent condition. $125.00 Military Photo ID Card of a Female Medical Nurse, 1940 issue. Shows that she was called up in January 1940 during the "Winter War" against Finland, served as a surgical nurse in a field hospital during the early part of the Patriotic War, and was released from active duty in February 1942. In excellent condition. $115.00 Red Army Photo ID issued to the Commissar of a Military Hospital in May 1942 issue. An uncommon early Patriotic War document in excellent condition. Contains a nice photo of the recipient wearing an M-35 uniform. $150.00 Photo ID of a Guards Artilleryman, a defender of Leningrad, issued in February 1943 during the siege. In very good condition. $75.00 Narkomat of Defense Photo ID Card, issued in May 1943 to an instructor of a Military Chemical School. In excellent condition. $130.00 Photo ID Card of a decorated Red Army Lieutenant, commander of a 45-mm antitank artillery battery. Issued in July 1944 and shows entries through 1946. In excellent condition. $95.00 Photo ID Pass of the HQ of the Soviet Military Administration in Germany, issued in December 1946 to a Soviet naval officer. A highly uncommon document from the first post-war year. $50.00 Temporary Photo ID Pass, issued circa 1946-47 to a Red Army Colonel by an unspecified Soviet military academy. A very uncommon and enigmatic ID card. $45.00 Red Army ID Card issued in 1927 to a 15-year-old Cadet of the Ordzhonikidze Junior Military Academy in Baku, Azerbaijan. An extremely unusual document from an early Soviet military boarding school that later became the model for Suvorov military academies. 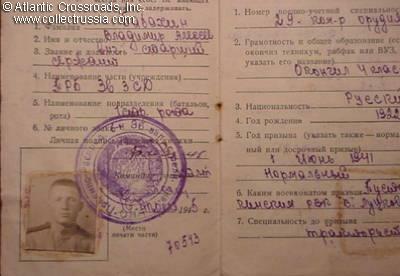 It is interesting to see that the owner of the ID was considered a career Red Army serviceman. In fair to good condition. $54.00 RKKA reserve officer's ID of a female medical doctor, 1934. Excellent condition. $30.00 Red Army Enlisted Man's ID, issued in 1936 by the Kharkov Military Commissariat to an ethnic Armenian upon his being drafted for active service. In good condition. $14.00 Killed in Action note, WW 2. Shows the name and rank of the soldier, date of birth and date of his death, and the burial place. $30.00 Killed in Action Note sent by the Narkomat of the Navy to the widow of an NCO who was killed in combat near Leningrad in 1943. Comes with a related document addressed to the Leningrad Military Commissar. $20.00 Missing in Action note, WW 2. The note shows the name and rank of the soldier, date of birth and month when he went missing in action. $25.00 Draft notice, early to mid 1930s. $45.00 NKVD Pass Allowing Free Movement in Town During an Air Attack, WW2 issue. $70.00 Invitation / Pass to participate in the Celebratory Meeting of the Leningrad City Soviet, Command of the Leningrad Front and Baltic Fleet, and Leningrad Communist Party in November 1944 dedicated to the 27th Anniversary of the October Revolution. Features Medal for the Defense of Leningrad on the front; named and serial numbered on the back. Very uncommon wartime document issued less than a year after the lifting the German siege of Leningrad.